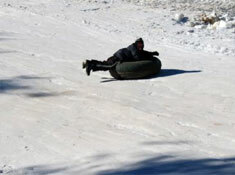 Scaly Mountain Ski Area is a warm, friendly, family-oriented resort offering ONLY tubing this season. They are open Fridays, Saturdays and Sundays (and holidays). Thousands of families have come to enjoy Snow Tubing at Scaly Mountain! They offer a large parking area that is located just off the highway and allows for easy access to the slopes and ski lodge facilities. The day lodge faces all slopes and is close to the lift so parents may take a break and yet observe their children from inside. After the fun, enjoy a beverage or snack from our snack bar—or just sit back and relax in front of our large wood-burning stove! Overnight lodging is available nearby. We will be happy to recommend lodging upon request.